When I first met Julie and her family about 4 years ago, I had no idea about the battle they were facing. Her smile was as wide as the sky. So, so happy. That was the definite thing I took away from the session: this family is beyond genuinely happy. It wasn't until I heard from Julie again after that first shoot, about a year later, that she confided in me that she was going in for another aggressive round of chemo and she wanted images before the aftermath. I had no idea she was battling cancer. A year later, her amazing husband Craig reached out to me around Mother's Day and wanted to buy her a gift certificate for another session. He couldn't say when it would be as she continued to battle and receive treatments and not be up to pictures so we left it open ended. Last year in 2014, I heard from Julie and she was ready. But then, her daughter got sick and we had to reschedule- and it brought us into a time again where her future was uncertain in regards to the reaction of her body to the treatments. And then I sent out my email announcing my pregnancy to my clients. Julie sent me one of the sweetest notes I received to date regarding the news, and wanted to see if we could finally do that session before I left on maternity. 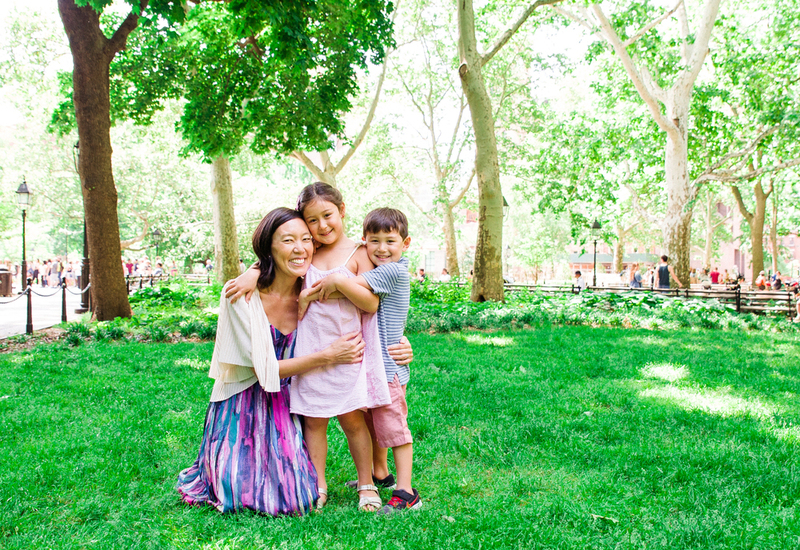 We met up at Washington Square Park a few weeks ago. Her beaming face lit up the already sunny park. And the kids, OH the kids! They had grown so much as had their amazing personalities (see top image above). She also had a few IV's in her arm. Her pretty shawl concealed what was going on under the surface. And that is what made me take pause as I edited these images. To those passing by in the park, this was simply a family having fun. A family who busted out in dance moves when the big band sound started permeating through the park from a pop up band. A family who I never direct to get close together. They just do. No one knows Julie's story. No one knows what she and her husband go through on a daily basis. But what astounds me literally is that their zest for life is so much bigger than most any of us who suffer from nothing more than a bad day, a missed train, or a common cold. To me she's surviving because she is a fighter and most importantly because she is GRATEFUL. Though I don't see Julie in private, I can tell you for the past four years her temperament was never anything short of joyous when I did see her. Always asking about me and recently sharing in the joy of this baby like we were decade old friends. As I navigate the ups and downs of this cancer journey, your photos are my rock. I bring them with me into the operating room (I'm not kidding-in a ziploc baggie) and they tuck it under me so that my kids are with me. They remind me of where we were and how far we have come. And I will be right there capturing these moments for you for as long as you continue to give me the honor.